Protein is not only a necessary part of your diet, it's also one of the healthiest and most beneficial parts. Protein helps muscles grow and repairs damaged muscles. Many bodybuilders and fitness experts advocate the consumption of protein shortly after a workout to maximize the muscle-building benefits provided by protein. A common way to consume post-workout protein is by using protein powder to make a shake. Whey protein powder is considered the best option. Whey protein is said to be the best and most pure source of pure protein available, and it is usually very low in fat and great for building lean muscle. There are two major types of whey protein, isolate and concentrate. Whey protein is also commonly used as a meal replacement for people trying to lose weight. Protein contributes to satiety, which can help prevent overeating. Since whey protein contains a high percentage of protein and only small amounts of fat and lactose, it is considered an ideal choice for weight loss. Because whey protein increases lean muscle mass, it also increases basal metabolic rate, which is the amount of calories your body burns at rest. Higher basal metabolic rate is linked to easier weight loss. Bardzo dobre białko. Dobra rozpuszczalnosc, wchłanianie - zero problemow zoladkowych, a mam wrazliwy zaladek. Spelnia swoja role. Poza tym cena bardzo atrakcyjna. It can be used by individuals who are on a low carb diet, and people with lactose intolerance, because the product is completely free of this component. The product is recommended to people engaged in increased physical activity and a problem with a provision of an adequate supply of protein with meals as a dietary supplement. Depending on individual needs it's recommended to consume 1-3 portions a day. 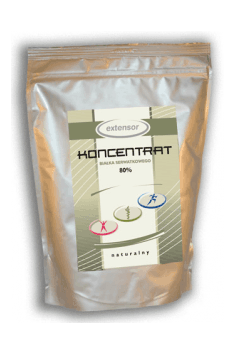 Extensor is an experienced and highly regarded manufacturer of diet supplements and sports nutrients. The company has got high-protein supplements with easily digestible whey proteins, also containing glutamine, which has an important role in metabolic processes and should be replenished during workouts.